GenreOnline.net: KUMIKO, THE TREASURE HUNTER -- coming June 30th to Blu-ray from Anchor Bay Entertainment and Amplify Releasing! KUMIKO, THE TREASURE HUNTER -- coming June 30th to Blu-ray from Anchor Bay Entertainment and Amplify Releasing! Beverly Hills, CA – Anchor Bay Entertainment and Amplify Releasing present the story of an odyssey that is also an oddity, KUMIKO, THE TREASURE HUNTER. Directed by David Zellner, written by David and Nathan Zellner, and executive produced by 2011 Academy Award® winner Alexander Payne (The Descendants), this festival favorite won the Jury Prize at the Fantasia Film Festival and received a Special Jury Prize nomination at the Sundance Film Festival. Bringing a generous cache of dark comedy and bright drama, KUMIKO, THE TREASURE HUNTERwill be available on Digital HD and On Demand on June 19th and on Blu-ray™on June 30th. Kumiko (Rinko Kikuchi, 2006 Oscar®nominee, Babel) is a cubicle-bound office worker seeking to escape her dour working life. Relying on her imagination and unabashed courage, Kumiko thinks she has found a way out: she has become obsessed with a battered tape of a popular film – mistaking it for a documentary. In particular she is fixated on the scene where a suitcase of stolen cash has been buried in North Dakota’s bleak landscape. Believing this treasure to be real and waiting to be discovered, Kumiko leaves behind Tokyo and her beloved rabbit Bunzo to recover it – and finds herself on a dangerous adventure unlike anything she’s seen in the movies. 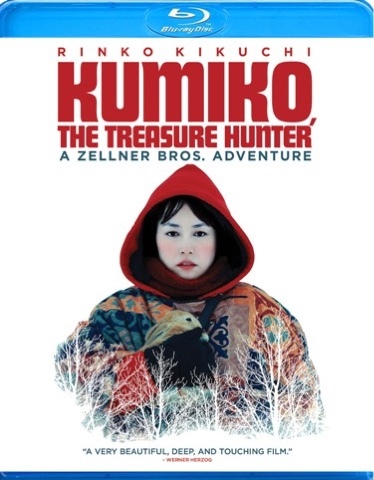 Inspired by an urban legend, KUMIKO, THE TREASURE HUNTER is a beguiling journey of determination and delusion. Sean Porter’s (2015 Independent Spirit Award nominee, It Felt Like Love) cinematography has created scenes of stark, cold beauty as we follow Kumiko’s dogged, misguided journey through the snowy countryside. A quiet narrative of the mind’s perils and enticements, KUMIKO, THE TREASURE HUNTER gently reveals the twists and turns of the imagination that lie buried within us all. The KUMIKO, THE TREASURE HUNTER Blu-ray™ bonus features include an audio commentary with the Zellner Brothers and producer Chris Ohlson, as well as deleted and alternate scenes.